Given its title, which includes the Japanese onomatopoeia for a beating heart, we already know that Dan Salvato is an anime fan. Deep within his Twitter feed you’ll find some screencaps of the mobile rhythm game Love Live, a anime and game series about cute popstars. If you check out his YouTube page, there’s a perfect playthrough of one of the songs on the hardest difficulty. Although he’s clearly a huge anime fan, he described his relationship to the genre as “love/hate,” saying that he feels like the trope of “cute girls doing cute things,” can be both an asset and detriment to shows. Some people love the anime aesthetic, while others are very put off by it. From there it’s not hard to divine the genesis of Doki Doki Literature Club, the surprise hit horror game that’s disguised as a cute visual novel about an after school club with adorable girls. Salvato said that he designed the game with both people who love cute anime girls and people who would never watch an anime starring clumsy doe eyed girls with pink hair. Either way, you’re not going to get what you expected. Doki Doki Literature Club is actually a horror story, one that will freak you out whether or not you initially like these girls. Doki Doki Literature Club is a dark game. It isn’t full of jump scares or horrifying images, but instead a growing sense that things are wrong and they’re not going to get better. Salvato has a knack for writing not just cute anime girls, but people with complex internal lives that they only give you glimpses of. It’s hard not to get connected to these characters, or to want to protect them from their grisly fates. For a 25 year old, Salvato has a lot under his belt. He’s a former professional Super Smash Bros. player, and additionally created a popular mod for Melee, 20XX Tournament Edition, and contributed to the notorious Project M. On top of that, he’s the creator of FrankerFaceZ, a Twitch extension that provides custom emotes and moderation tools. 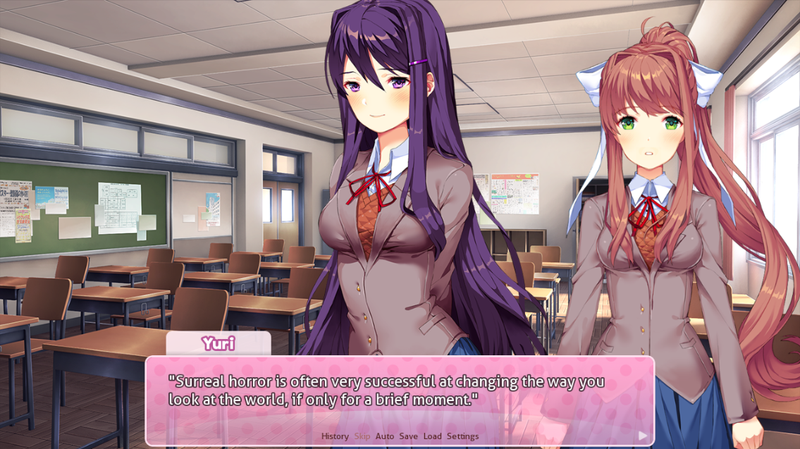 Doki Doki Literature Club is his first game, and he released it for free after working on it for two years in secret. After its release, it slowly but surely gained ground on Twitch and Youtube, and is now a cult hit. It’s true that the game is scary, which usually makes for good Let’s Play material. Doki Doki Literature Club is also quite human, and speaks frankly on some sensitive subjects. When one character described her experiences with depression, it’s impactful because it doesn’t feel like a cheap way to garner sympathy. This empathetic writing seems to have contributed to its success. Salvato told me that he especially appreciated hearing from fans about these more serious themes.